Our range of products include plastic tensile strength tester and plastic tensile testing machine. 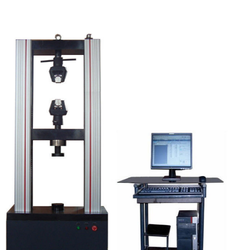 We are one of the leading manufacturers of Plastic Tensile Strength Tester. We are manufacturing Plastic Strength Tester as per International Standard ASTM D 638-10 and ASTM D882-12. These standards as globally accepted by all plastic products manufacturer. Plastic Tensile Testing Machine has two models, Digital and Computerized.